This report is the result of a conversation I had with a Christian, who asked me in the middle of the conversation all of a sudden whether I could explain the winter and the Sabbath. I told him straight away that the meaning of John 1:12 is hidden there in. I was quite surprised! Because the conversation was in the 1st degree of knowledge and took already more than 10 minutes. And suddenly, without any reason, he came with this question, which can only be understood in the 2nd degree of knowledge. Although I had answered the question perfectly, he was not able to provide one single answer or any other question in the 2nd stage of knowledge. If he had been born again, out of the spirit, he would not have asked this question. A Son of God in the 2nd degree knows that this “flight” stands for the racecourse of Paul. Within a time lapse of three months (June 23rd until 20th sept.2014), I distributed 1000s of leaflets, of which I gave this brother a few hundreds too. It was the last I had left. I told him that he may copy these leaflets and further distribute. It is strong material to tell people about Jesus. Because the ‘Gate of Mercy’ is already almost closed, people are highly interested. Nowhere in the Bible there is a text that equals to Matthew 24:20, not even approximately. But without this Christian person knowing it, the Lord let me realize something very important. One thing is absolutely clear to me. It must have been Jesus, who made him pronounce this text. The mystery of Matth.24:20, I already knew. But the Lord made it clear to me with this verse, that I should preach I John 1:12! Up to five(!) times Jesus clearly indicated me to preach John 1:12. The first time it came through a brother and then another four times in sept.2014. At that time I was in Suriname. Jesus gave me through in a vision during the night of Saturday (Sept.7th. ), Sunday (8th) and Monday (9th) and on the night of Saturday 13th sept.2014, that I should preach I John 1:12. Not only about the approaching Rapture, but also about the mystery of the Rebirth out of the spirit! (Paramaribo/Suriname) On the parking place of the Tabernacle (Full Gospel congregation), on Sunday 24th aug.2014, I approached this Christian who stood by his car and I started a conversation with him about the End Times. See now what I have written. On Earth both angels and Sons of God are born. More and more worldly people come to an understanding and repentance, these are factually many millions. And the number is increasing! But, Sons of God, in fact are increase less. To God the Father the importance lays with His last Son, yet to be born again out of the spirit. And that is what the waiting is for, the Last Son of God the Father. The last Benjamin. The latter shall be benefitted only for three weeks with his insights and then the Rapture is a fact! After that Armageddon breaks out! The following is a copy of a report; “The mystery of Joel” The Last Great Revival! 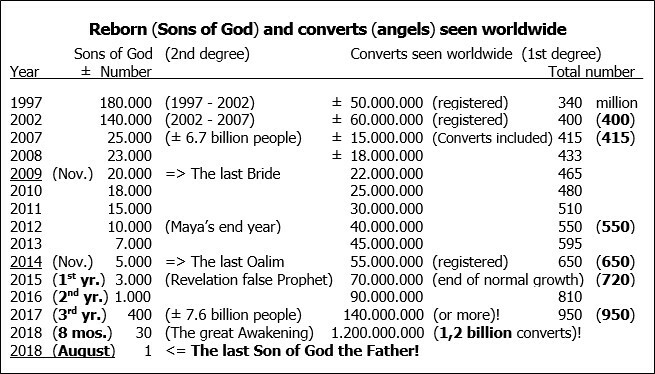 See the calculation of all converts and the Sons of God. However, the number of people that comes to living faith and repentance, monthly increases with millions and as the End Times approaches, even with tens of millions! The calculation is approximate. The number of sons may actually be much higher or lower. The birth of the Last Son of God the Father (The last Benjamin) will happen in the month of August 2018! During this month the Rapture could be possible and depends on when the Trial by fire (Rev.12:2) breaks out with this last convert. See: (John 1:12-13) The Rapture should take place before Pentecost, as by that time there will be a great feast in the heavens of God. Do not be surprised, as you might read something for the second time. It is often an impetus for preservation of knowledge and receiving insights. Because without understanding is it really impossible that any knowledge can be obtained. It does not work otherwise. (Matthew 24:20) “The winter and the Sabbath” cannot simply be interpreted as such, because the level of it, can only be seen in the 2nd degree of knowledge. For example: Someone of an Academy (High School) or University is talking very different from someone of the elementary school, or secondary school. Likewise it should be understood with a person who lives in the 2nd degree of knowledge. He talks very different from Christian (convert) who act and live at the level of the 1st degree. Therefore it is observed and recognized directly by a Son of God (2nd degree) at what degree a Christian is situated and lives. This is unmistakable! We are very close to the Rapture when Jesus comes to pick up His own. In the first half of this last year week (2x 3,5 years) the converts still have time to understand this writing until August 2018. If they do not, the chance to experience the Rebirth out of the spirit will be lost forever and be closed forever more. Afterwards it will never happen again that another Son of God the Father could be born. This event is unique! In the billions and billions of years that follow, only angels (forces and powers) will be born. In the vast universe, there are many earths with people on it. Our Earth is called the blue planet. And only on this planet Sons of God are born during a period of 2,000 years. The rebirth of the spirit (Repentance), 1st degree. The rebirth of the soul (Underwater Baptism), complete immersion. See the following, because that is the “winter” and has to do with the explanation of Matthew 24:20. There are three powers in the End Times: The Beast, the False Prophet and the Antichrist. The Beast that initially presents himself as the lamb, but quickly will turn into the dragon, stand for the US and the EU. (EU: The United States of Europe). The False Prophet and the Antichrist concern one and the same person. Their time of reigning: 2x 3.5 years each. The first 3.5 years, will actually be the most beautiful time. An enormous economic upswing will arrive, such as man has never gone through before. Jesus says about it; “That such a time never existed.” Then man will enter into the last coming 3.5 years with Armageddon. But just when the Devils “Code” or “Logo” (666) shall be compulsory for all human beings, then immediately (within three weeks) the Rapture will take place. (John 1:12) “But to all who received Him, who believed in His name, to them He gave power to become children (sons) of God…” Who then in prayer, seizes this power of the Holy Spirit, trying to take possession of the inheritance of God, just like Jesus, can achieve also to become a son of God the Father. Because the Holy Spirit is the power that should therefore be called upon. Jesus, was actually the first one to experience this. To become the first born Son of God the Father. This report of the last ‘Benjamin’ will surprise many Christians. But, it is the full truth which unfortunately cannot be understood by everyone, especially when it comes to the date of the Rapture. Because we have not much time left. At that time my parents lived in Zorg en Hoop and the call took at least 10 minutes. Now I am 63 years old (born in 1952). Wherever I go to in Suriname, people come to understanding and repentance. Many are surprised how and in what way I bring the Gospel. They have never heard anything like it. As often as I bring forward details from the Bible, the Christians are very surprised. Many have therefore asked me what my background is. My parents were Roman Catholic. But I came to a living faith in Sept.1977. I was 25 years old. That was the very beginning. A year later I went for the complete underwater baptism. For two years I went to “The Bible Speaks” in Dieren (a Dutch village) and then to a Pentecostal church in Arnhem and also to the Bethel Church. After that I visited many other congregations too. Since Brother Karel Hoekendijk founded the church called “Streams of Power”. In the beginning I used the name of that church and also the address, for all my leaflets. Those were incredibly many small booklets and leaflets, which I have handed with others and through others to the people in Paramaribo and beyond. First: Jesus knows everything about me and what I will do for him in Suriname and other places. Second: The testimony of Karel Hoekendijk to my parents, concerning the eldest son Jan. Many Christians in Suriname know this evangelist as a great Revival preacher. Third: The Bible. Mainly see John 3:11! Whoever is not reborn out of the spirit before time, that person will become an angel! Christians and Pastors are really surprised that Jesus has not come yet with the Rapture. I know many details concerning the Rapture. However, the waiting is for the last “Benjamin” who still must be reborn out of the spirit. Afterwards no one will be found by the Holy Spirit anymore who could be born again out of the spirit. That is because the spirit in this world shall no longer allow it. About five months before the Rapture will occur, the Holy Spirit will come with the great ‘Revival’ and bring 1.2 billion people towards insight and repentance and will baptize them personally. Even after the Rapture many tens of millions of worldly people, can you imagine, shall convert their hearts on their own. Added to it there shall be another 400 million Christians who were not worthy to be included in the Rapture. However, these “rest Christians” – “..the rest of her offspring…” (Rev.12:17) will all be killed in the period (3.5 years) of Armageddon. But, Sons of God cannot be born anymore, not even during the millennium. Because, after all, the Holy Spirit is already gone from the earth. And without this power (Holy Spirit), it is impossible to be born again out of the spirit. See: (John 1:12) “The Latter rain” of Joel (2:23/28). The Great Revival begins when the last convert has been able to obtain the insight into the 2nd degree (John 1:12). Then, within five months he will be born again out of the spirit. The last Benjamin, the Last Son of God the Father. (Joel 2:23) “And ye children of Zion, and rejoice in the Lord your God, for he gives you the teacher of righteousness; yes, the showers let him come down for you, the former rain and the latter rain, as before.” This verse concerns the underwater baptism, that will occur at the same time as the big Revival. This verse is about the last great Revival. The 144,000 Messianic Jews do not belong to the elect. The elect are the Jews. Because Jesus came from the Jews, the chosen people of God the Father. And Satan is really all set to crush the Jews and destroy them entirely. In July 2014, the Lord told me that the level of the Bride has already closed since nov.2009. I thought that the level of the Bride would end in 2012, because as such I had written it. The Lord however has given me this correction. See: “The countdown of the era” . The special thing is, that I have described the last Oalim earlier in the report “The mystery of Joel”. The level of Oalim has been closed since the end of nov.2014. But when the Lord made it clear to me in July 2014, I was still surprised about this. In spite of the fact that I had described this already 7 years(!) ago. Because I was thinking that the level of the Oalim at all times could be achieved by a Son of God. However, this is not the case. Those doubts continued to haunt me, because of the force that belongs to the Oalim. The Lord has inspired me though that I had described the time of the Oalim correctly. We are now waiting for the last Benjamin! The countdown has started on May 14th, 1948 with the creation of the State of Israel. With God the Father a generation is exactly 70 years. Indeed, this generation will not pass away. The hour and the day we do not know, but the year all the more! The Lord showed me in a vision / prophecy clearly to be ready in the month of August 2018! The interpretation of Matth.24:20 is the 2nd degree of knowledge and quite complicated and is supported by many insights. But it cannot be brought differently. Enter into prayer if it becomes too much. The Rebirth out of the spirit. There is still yet, a very short, time to come to an understanding. (Rapture August 2018!) “Pray that your flight be not in the winter, neither on the Sabbath.” (Matth.24:20) The translation of this verse is; “Pray (therefore) that your get-away be not in the winter” that is, in times of great woe or in the last days, “or on the Sabbath”, which is the Millennial Kingdom, for such an opportunity will never come again. 1) Winter or large woe = one at the same time. During a war, there is no Rebirth of the spirit possible. But there will always be many people that convert their heart during a war. This conversion is the Rebirth of the spirit. The rebirth of the soul concerns the underwater baptism and in many cases this brings the Holy Spirit, for the first time to the convert. 3) The Sabbath => the millennium. A Christian can only achieve rebirth out of the spirit by the power of the Holy Spirit. The achievement of the sonship of God will have come to an end after the Holy Spirit, along with many Christians, will have been taken away with the Rapture. Eq. (John 1:12) The Holy Spirit is the power that must be seized to achieve this mystery. Peter must have thought: “Am I not already converted?” However, the Lord spoke about the rebirth out of the spirit and Peter was not yet born again out of the spirit. Of all the disciples, Peter would be the first who would be born again out of the spirit. When the last one has been converted to Rebirth, the Rapture will become three weeks later. The Lord God the Father will wait with the Rapture for this last one. When the woman (a convert) has become pregnant through the power of the understanding, the development of Rebirth is unstoppable. (Rev.12:1-5) The woman of the Lord (God’s church) will then soon bring forth a convert being reborn out of the spirit! Whoever achieves the insight in the 2nd degree, directly overlooks the mystery of the Rebirth and the Trial by fire is on its way to come! For he or she who represents the woman (in the church of the Lord), is pregnant. The waiting is now for the birth of the Last Son of God the Father. The last Benjamin. Then the Holy Spirit will find no one else anymore, who will be able to be born again out of the spirit. Within a period of six months, the Lord showed me this fact up to 3 times! This is not a simple conversion, but one who comes forward as the ultimate person to experience the Rebirth. That means when the last one has experienced the Trial by fire (Rebirth). Converts will always remain, especially after the Rapture! When I entered into prayer and wanted to ask a question about it, I heard; “When the last has come to repentance, the Trial by fire will be no more.” And that was it. The seven heavens and the gap found between the 5th and the 6th Heaven. Another paradise outside the Kingdom of Heaven. The pounds and the talents. The 1st and 2nd Trial by fire. The Fire Knowledge in the 2nd and 3rd degree as well as the mystery of the 1st until 4th heart. The seven folded seal of the soul on earth. The mystery of the prodigal son and the martyrs of God. The mystery of the crystal river. The face of the Abedam as the Oalim. I also saw the nine Angel Choirs and corresponding spheres of the Heavens, of which the second and the third heaven are both separate. The entire “Between Firmament” in two parts A and B and the five continents. The more than 200 million earths with people on it. The mystery of the planet of the unreasonable man and the Malona planet (2000x larger than Earth). The mystery Earth and the ultimate purpose of God the Father with the Earth. The birth of Michael and Lucifer’s fall. The fight between God and Lucifer for the sonship of God as first born on the planet Earth. The mystery of Satan and his sons (Devils and Demons) and the birth of the Antichrist. The Mystery of the False Prophet and the Antichrist. (This is the same person). The horrors of Armageddon and the 666 hidden in a ‘Sign’ or a ‘Logo’ and the birth of human polyps. The secret of the Holy Spirit of God, as the Father. The mystery of the Trinity. The right Throne of Jesus and the Bride and the left Throne of all Oalim. The mystery of the underwater baptism and “The latter rain”. The 144,000 boys. The mystery of Enoch and the two prophets (Moses and Elijah) clad in jute bags. The Rapture of all ranks of Christians and those of the Lords who will return with the Kings to earth. As well as, how, and in what way the Kings are born for the millennium! The birth of the Bride and all its secrets, as well as drinking from the Cup as well as the achievement of Thrones! The mystery of the Angels themselves and the Sons of God. The mystery of the wise and foolish virgins, only to be seen in the 2nd degree of knowledge. The mystery of the soul and its birth and the development of the soul as an agion. The birth of a spirit and its further development. The birth of an angel and all Superiors among the angels of God, the Fire Angels and Solar Angels and many more details. The meaning of this is: The Trial of Fire of the Rebirth out of the spirit. Whoever achieves this level, looks with one eye into the 2nd degree of knowledge. After all, this is a Son of God and he has all kinds of knowledge in the 2nd degree. They are mostly insights. Because without understanding it is really impossible to achieve any knowledge in the spirit. Many true Christians of God approached me with all kinds of questions. But Matth.24:20 requires a broader explanation. Therefrom the length of this report. A mystery in the third degree! So, who will believe me? No one will believe this revelation. Many will not believe, because they have no faith! The lack of trust among people is truly enormous. Who will believe this experience? The Lord replied, “Only those who belong to my true church will believe you.” It is the Holy Spirit! Part of text (Matth.24:20) From the book “At the Feet of the Master” By Sadhu Sundar Singh. All texts are taken from the King James Bible and supplemented by prophecies according to John 16:13.